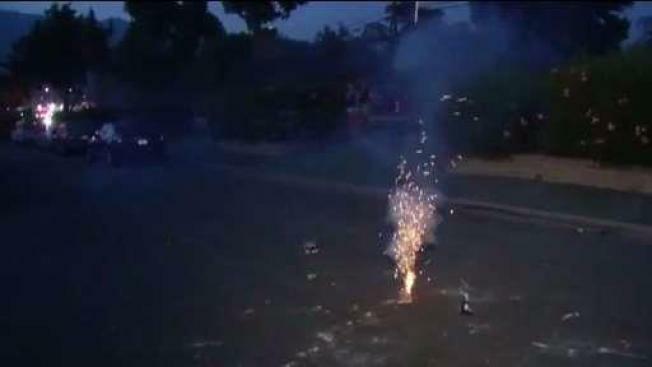 South Bay fire agencies and neighborhood groups are both vowing a crackdown on illegal fireworks during the Fourth of July. Robert Handa reports. South Bay fire agencies and neighborhood groups are both vowing a crackdown on illegal fireworks during the Fourth of July. In one of San Jose's designated "hot spots" for illegal fireworks, Bonita Avenue, a growing concern prompted neighbors to take action. "It's still disruptive when you have military-style, military-grade explosives blowing up in the air and shaking your house," said Jeff Levine with the Roosevelt Association. The neighborhood group near downtown San Jose has had good success chronicling the fireworks. Members said they have high hopes for an online tool promoted by South Bay fire agencies, which allows people to upload pictures of illegal activity. The information uploaded onto the website allow investigators to fine and fine violators. An updated version of that app was rolled out on the San Jose City website several weeks ago and people are responding. San Jose Fire Department Capt. Mitch Matlow said around 660 people are using the online tool, with about 120 of those reports giving crews enough information to take action. Meanwhile, police and city code enforcement will be focusing on hot spots and reports from the online tool. In San Jose, the fine for an illegal fireworks display is $500.